Before gaming consoles hit the market in the 80’s, gamers had to visit the arcade and wait for a machine to be available for their turn to play. This created a sense of community and players watched more games than they played, especially if their supply of coins was low. The emergence of streaming is bringing this experience back and watching games has become its own form of entertainment. What will working on game development look like in 2019 and beyond? Where should you brush up your skills? Take the Developer Economics survey and get to shape the future of game development. One of the reasons Fortnite has become so popular is because it is so watchable. Streaming is creating a new channel for developers to promote their games and generate revenues. Gamers can actually watch experts play a game before trying it themselves. The trend is also bringing new capital into the space. Streamers can make big money attracting subscribers to follow them on their channels and sponsors are paying to promote to these audiences. Ninja, the most successful streamer, is reported to make $500,000 a month from his streams. While this revenue does not go directly to developers it does bring a new source of capital into the ecosystem, introducing new opportunities. This new revenue source is helping spread more money across the industry. In the first half of 2017 only 29% of game developers were making more than $100 a month. In the first half of 2018 that jumped to 48%. While many factors may be influencing revenue growth, streaming is providing a new way to engage with video games, passively, providing opportunities to innovate new business models. 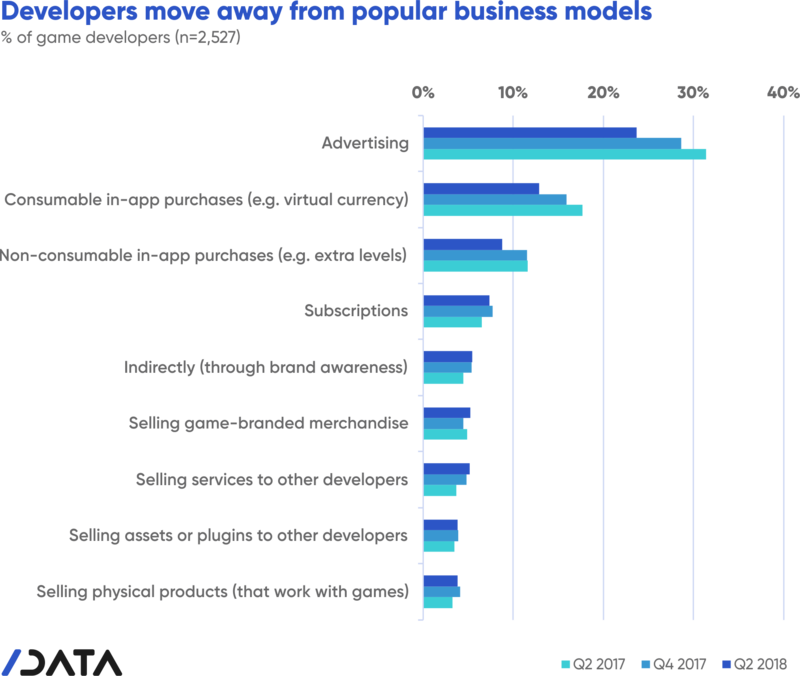 One dominant trend in game developer business models is that developers are focusing on a fewer number of them, and the more popular ones such as advertising and in-app purchases are getting significantly less popular. Presumably this is due to developers focusing only on revenue sources that are producing for their apps. However, the use of a few less popular approaches is growing. This can be traced back to a growing communal and collaborative environment in the gaming space. Symbiotic relationships are emerging among streamers, developers and gamers that are beginning to change the economics of the industry. number of developers making money through selling services, assets and plugins to other developers. The communal effect fueled by streaming is also leading to increases in subscription games such as World of Warcraft which keep players engaged in the community. Developers are also making money through subscriptions to their own live streams of their development process. As the rock stars of streaming create a new entertainment experience, development and streaming platforms are innovating new ways to provide opportunities. Twitch has launched extensions which enable viewers to engage with the game stream through web overlay extensions developed by third parties. Developers can create stats views or side games and split profits with the streamers who are attracting the audience. Unity content store is providing a channel for developers to deliver plugins to other developers, another channel for delivering game software. As games are passively consumed, it also provides more opportunity to sell merchandise. 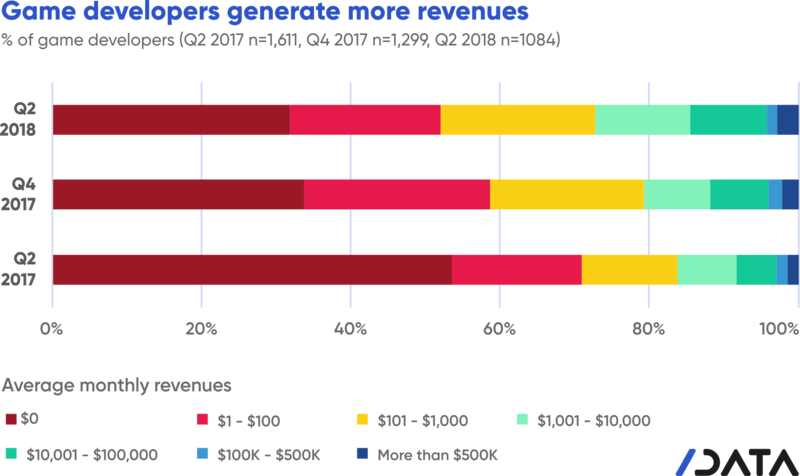 We are seeing an uptick in developers generating revenues this way. Cryptocurrencies are another trend that is helping spread the wealth across the industry by enabling developers, streamers and gamers to make micropayments to influence behaviours. Gamers can tip streamers when they are entertained and developers can pay streamers to promote their games, all through cryptocurrencies. Bits, the cryptocurrency within the Twitch platform which allows viewers to tip streamers, generated $12 million in the service’s first 10 months. As gamers congregate in communities around streamers, developers can reach these prospects without having to go through an app store. 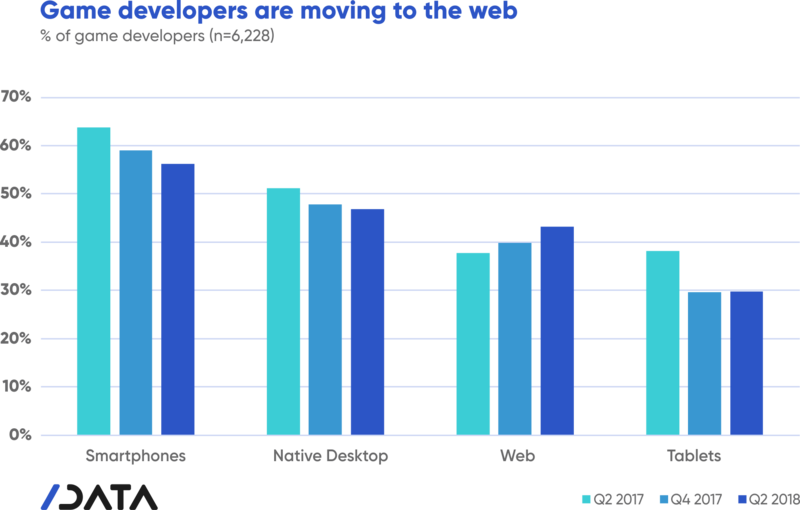 Moreover, smaller developer teams don’t have to build for each platform and can have more control of their app and engagement with their audience via the web. New Twitch extensions are also web based, providing a new product category for web developers. As the opportunity to make money becomes more democratised, the chance for real innovation grows. When more resources are spread around the industry, fledgling ideas have the economic viability early on and stand a better chance to get out of the starting gate. We are currently running another survey and we would value your input. If you’re a software developer working in the field of game development, or considering doing so, please consider answering the questions. Plus, if you refer other developers to take the survey, you may win up to $1,000 in cash.